This article was originally posted on No Game No Talk. I am reposting it here for visibility and to make it easier for my WordPress followers to make comments. One of my most memorable gaming experiences as a kid was FIFA: Road to World Cup 98’s indoor soccer feature. It was a 5v5 format played inside an enclosed pitch — you could ricochet the ball off the touchlines, and the reduced number of players and constant goalmouth action meant that goals were always plenty. It was the perfect game for gatherings, especially if you had the PlayStation One version. Connect four controllers to your console and you suddenly had the ultimate four-player party in your living room. Very mysteriously, EA Sports decided not to include indoor football for FIFA 99 and all subsequent FIFA games, and that was the end of this underlooked but incredibly fun game mode. 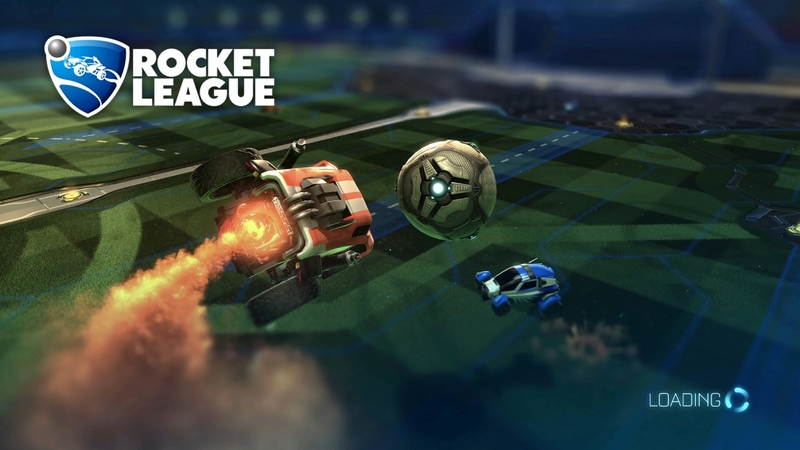 17 years later, we suddenly have Rocket League, a game that resurrects what FIFA 98 first started, but this time the football players are automobiles. 3v3, vehicular football combat is not new, World of Tanks had a football mode during the 2014 World Cup where you could dribble a ball around with your tank and shoot at it (and other players) with your turret. It wasn’t very fun. It was slow, ponderous, and extremely difficult to score a goal. Most matches would quickly become deadlocked with all six tanks stuck in one corner with the ball. I have this niggling feeling that the developers of Rocket League, Psyonix, had studied Wargaming’s effort prior to creating their game, because they have rectified the problem with a simple solution: speed. Every player has the ability to accelerate to breakneck speeds with a rocket boost. It’s not unlimited though — you need fuel to use your boosts, which is replenished by running around the pitch and grabbing an orange fuel power-up. They respawn pretty quickly, encouraging players to boost around as much as they want. And you have to, because the ball is also capable of its own feats of acrobatic acceleration. Approach the ball at the right angle and speed, and you can send it flying across the entire length of the pitch in a flash. The ball is also very floaty, and mastering the art of striking an aerial ball with a well-timed double flip is a skill that all wannabe strikers must learn. Defence can transform into counter-attack in a split second due to the unpredictable nature of the ball. Disciplined players can attempt to play as a dedicated goalkeeper or sweeper, but it is very difficult to keep a clean sheet, something that Psyonix had always intended from the start. Most goals are often the result of an unlucky deflection or a defensive misjudgment of the ball’s physics. It’s unpredictable and usually chaotic, but the game remains fun because of its simplicity. 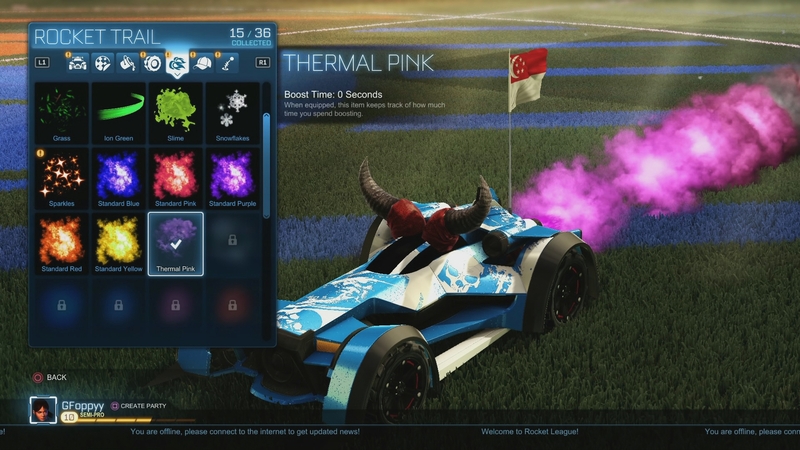 You don’t have to be a football fan or racing fan to like Rocket League. There are no pesky rules to remember like offside, and there are no fouls. Ramming your vehicle into another player to disrupt their concentration is a viable and legal tactic. Stoppages only happen after a goal is scored, whereby the game is restarted with a kick-off. 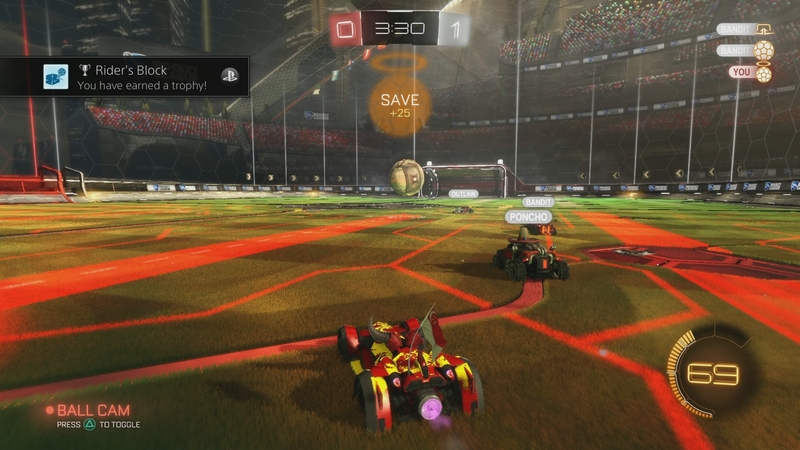 But perhaps the best design decision of Rocket League is the five-minute time limit. There is no half-time or stoppage time — once the timer reaches zero, the game ends. Five minutes is long enough to have a proper match, but also short enough to prevent frustration and tedium from setting in…unless the game ends in a tie. Drawn matches are decided by sudden-death overtime, the first team to score automatically wins. I’ve seen overtime games last as long as five minutes to as short as ten seconds. Racing fans will appreciate the responsive and satisfying handling of the cars. A nifty Ball Cam function locks your camera to the ball at all times, making it easy to orient yourself to the action. You can press square to enter a braking powerslide that helps you change directions quickly. There are jumps, double jumps, side jumps, and flip jumps, all performed with varying presses of the X button and analog stick. Dedicated gamers can master all of these moves from the game’s comprehensive tutorials, but they are not a requirement to enjoying the simplicity of a match — see that giant ball? Try to hit it into the opposing goal. Stop your opponents from pushing it into yours. Pick up speed power-ups on the pitch. Repeat. Your AI teammates and opponents are capable of performing all these tricks and moves, sometimes with better proficiency than a human player. They understand the flow of a match and know when to defend the goal if necessary. The only flaw I’ve seen is their bizarre habit of dribbling the ball into their own net while sprinting at top speed with a rocket boost. 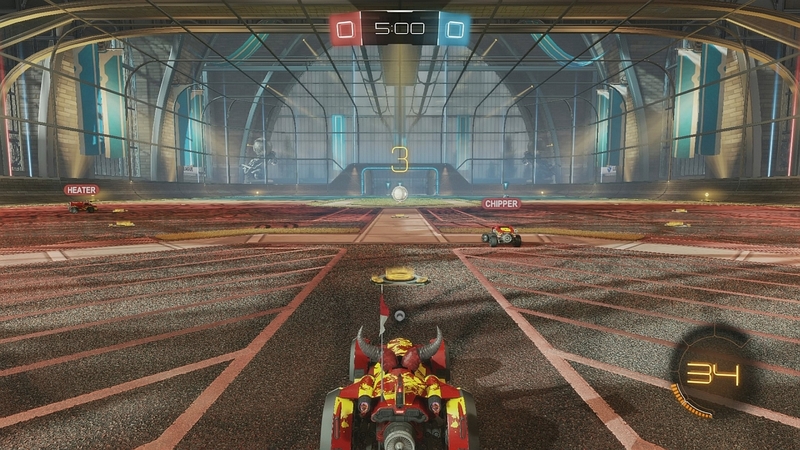 Online or offline, you have the option of switching from the default 3v3 to 1v1, 2v2, and even 4v4 modes. Psyonix has US, Europe, and Oceania servers for matchmaking, and I was able to connect to the Oceania servers with a decent ping of around 140ms. It’s very playable, but with occasional, minor lag spikes. Both PC and PS4 players have the ability to crossplay with each other, and PC gamers can change their nicknames on the fly within the Steam client. This is where football fans will be able to eke out extra enjoyment and entertainment from Rocket League. I once fought against an opposing team who had a player named “Zlatan” (Ibrahimovic). He scored a superb header the moment I connected, but was forced to play goalkeeper once his team went 3-2 down. I’ve seen teams made up of “Messi, Suarez, and Neymar” (MSN), and even encountered “Pirlo, Vidal, Pogba” (PVP). I hope those fans know that Pirlo and Vidal have already left Juventus. The problem with traditional football games like FIFA 15 is that after playing them for so long, you will eventually start scoring and conceding goals from the same repetitive patterns over and over. Psyonix shows us that sometimes, a little bit of randomness, exaggerated physics, and speed is all you need to produce one of the strongest contenders for 2015 Sports Game of the Year. Simplicity, unpredictability, and Zlatan: welcome to Rocket League.